Gosainkunda lake is one of the holiest sites in Nepal for both Buddhist and Hindus pilgrims. It is situated at the North of Kathmandu at 4,310 m from the Sea level. Around 108 big and small lakes are found here which are believed by faith-followers to be sacred. 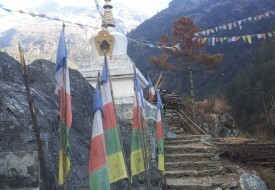 The Saraswati Kunda, Naag Kunda, Ganesh Kunda, Bhairab Kunda, and Surya Kunda are nearby on the route. According to the Hindu legend, the Gosainkunda lake was created by Lord Shiva who had swallowed the poison produced from the ocean when Gods and Demons were churning the ocean to get elixir from the bottom of the ocean. As the legend goes, the poison was spreading all over the world risking to destroy every living being. When nobody dared to swallow the poison, Lord Shiva came forward and swallowed it and stuck it at his neck. Fluttered by the burning poison, he went to the mountains and hit the glacier with his trident, produced water from and drank it to quench the burning pain. Every year during the full moon inAugust, thousands of Hindu and Buddhist pilgrims come here on a pilgrimage and worship Lord Shiva. Pilgrims believe that taking a bath in this sacred lake will wash all the sins and bad karma. During the festival time, you can see the many Shamans, Dhami-Jhankris (Psychic healers) perform their particular dance all the way to and from the lake praying the Lord. On the way to Gosainkunda, breathtaking views of Mount Langtang range, Mount Ganesh range, and Tibetan mountain range can be seen. This region is rich in flora and fauna. Many wild animals such as deer, wild goat, protected red panda, mongoose, squirrels, pikes, and many different birds can be seen. The region is also popular for rhododendron forest.